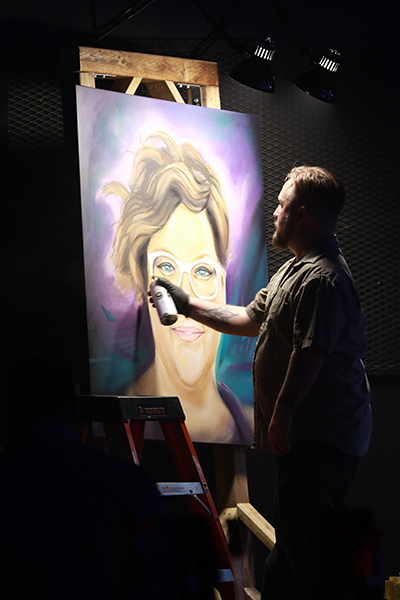 After 10 months of planning by volunteers, young professionals and entrepreneurs, art came unleashed at the seventh annual Saskatchewan Fashion Week 2018 (SFW) from May 10 to 12 at The Soundstage in Regina. It was the debut of a colourful reinvented show with artist collaborations, solo artists, fashion design, film and music. Opening night was dedicated to Saskatchewan’s up-and-coming artists, and featured youth, student and artist prodigies. The following two evenings profiled local fashion designers, along with artists, musicians, dance performances, films and creative collaborations. A reimagined stage allowed artists to interact with the audience; audience members and the public shopped The Black Market; and local musicians lit up the on-site after parties, also open to the public. Lorie Lindsay of Z99 and Tiffany Lizee of Global News acted as event hosts the first evening, while Justin and Greg of The Justin and Greg Show interacted with Regina’s own local house band, The Bureau, while hosting the final two nights. And what better way to bring it all to an exciting conclusion on Saturday night than with a crowd-pleasing “SFW Designer Battle” between Saskatoon designer, Laurie Brown, and Prahsik founder, Janis Procyk! Firdausi Yusuf of Regina was thrilled to be a part of SFW for the first time, where she showcased her FiFi X spring/summer collection made with vibrant African prints on various textiles. “It was a huge honor to be able to debut my first collection to an audience like SFW. Because of the event, I had a lot of traffic to my website, got coverage on CBC and got to meet different people in the arts community and industry contacts that I will be working with for my next collection. SFW has given me the drive and exposure I needed to continue to pursue a career in fashion.” Find Firdausi’s designs at fifi-x.com. Originally from Regina and now located in Vancouver, B.C., Joseph Friedrich of Joseph Friedrich Creative displayed his casual men’s collection called “Introduction.” A newly graduated industrial designer, Joseph explained his unique runway show: “Getting involved with SFW helped me realize ideas that had been in the works. I wanted to compose a track that would allow the clothes to take centre stage. Breaking the track into discrete acts allowed me to incorporate two live musicians into the back half of my set — Kiriako Iatridis, a long time SFW contributor (on guitar), and Eder Gorzonas (on drums). This dynamic allowed the walk to build in intensity and keep the audience’s attention throughout the roughly six-minute duration.” Discover more about Joseph at josephfriedrichcreative.com. 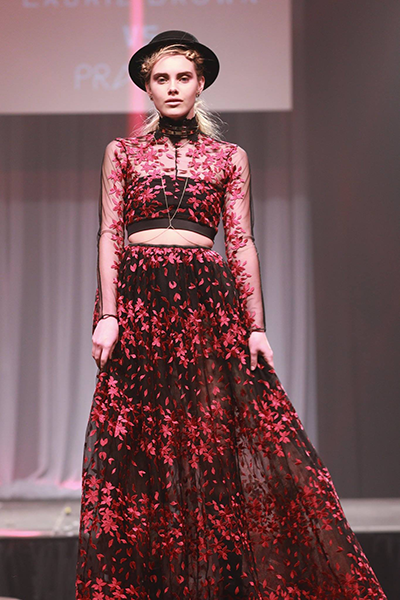 Rea Harbus of Regina is no stranger to the SFW runway, where she made her fourth appearance with her Amaranth Designs spring/summer “Playful” collection and her new plus-size line. In business as a designer for the past 18 years, and now working at it full-time from home, Rea praises SFW: “It’s a fun show to do; you get to dress the models, you get to pick hair and makeup and style everything. They brought a few more elements in this year that made it more exciting for the crowd, too. SFW helps people understand that this is a business, not just somebody who sews out of their home.” Check out Rea’s designs at amaranthdesigns.ca. Recognizing the importance of Indigenous culture and history in Saskatchewan, SFW collaborated with The Mosaic Company in 2017 to create this award that provides $2500 to the winner and the opportunity to show on the SFW runway at no cost. Stephanie Grace Gamble of Lysias Designs was this year’s recipient. A self-taught fashion designer, youth worker and mother of three, Stephanie is Cree Iskwew from Beardy’s and Okemasis First Nation. SFW introduced this award in 2013 to encourage professional development for the province’s emerging fashion designers. 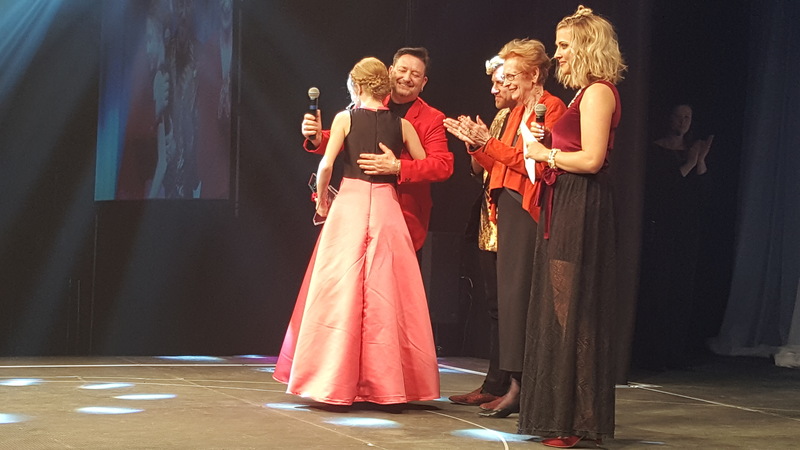 This year, the award went to 11-year-old Raina Haus of Regina, whose Raina K. runway show this year made her the youngest designer to ever show at the event. Raina received a three week paid internship at Dean Renwick Studio, funded by award presenters, Dr. Roberta McKay & Mr. Elmer Brenner. This year, Saskatchewan Fashion Week focused on fashion, art, music and some extreme nails! Yes, nails — more like claws really! I was there for it. I was very impressed with the variety of designers this year, as well as the mix of model ethnicities and body sizes. Each designer had such a unique aesthetic that truly created a one-of-a-kind experience for guests to be immersed in. From the short film introductions to the background music and models, their themes and visions were set to tell a tale. On Thursday, the show-stopping Eman Idil collection stole the night. Actually, designer Eman Bare was my favourite of the entire three nights. She used very unique textures and shapes in her garments, with a mixture of a colour pallet of soft nudes and some splashes of reds and blacks to give it a pop! Each outfit was styled to perfection, with either a playful turban or beret on some of her models, giving them an edgy yet classic look. Eman really took me out of Regina with this collection — and into Paris! The following day, the collection by Helen Oro Designs paid tribute to the First Nations, and Helen’s outfits were chic in unique patterns and had some creative accessories. 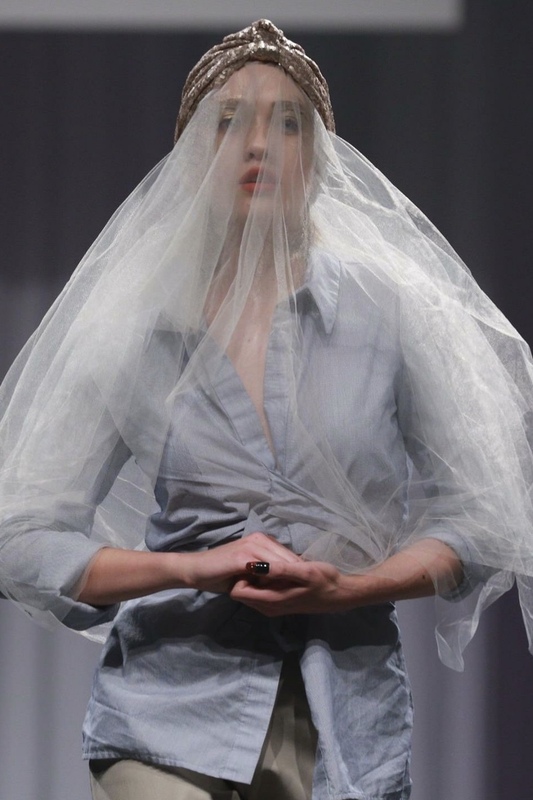 From ready-to-wear to couture — she had it all. Some of my favourite details were the mouth masks worn by her models. That really made a statement! On Saturday, Cedar & Vine brought a very boho and glam feel to the night. 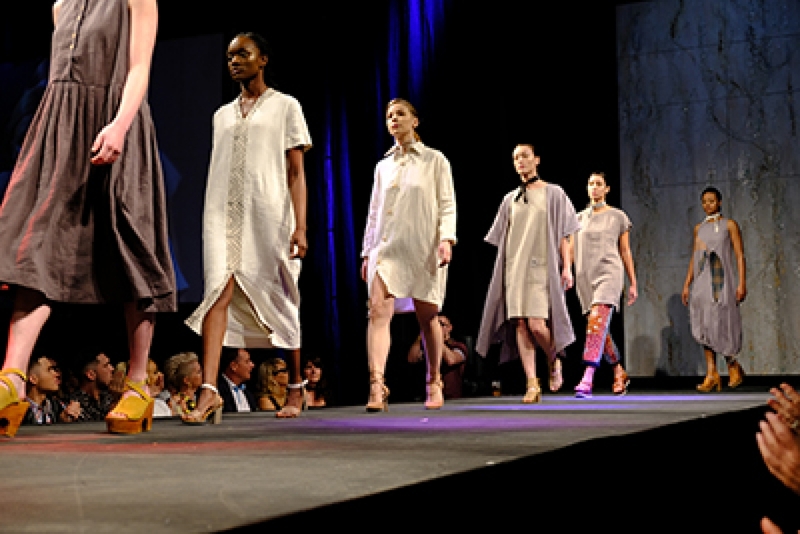 The models walked barefoot wearing some oversized garments that seem to be perfect for almost all body types and ages. The collection consisted of the grey scale and very earthy tone. Laurie Brown gave me all the “90s feel” that I needed, using velvet floral mesh and many different throwback materials. Each model was styled with beautifully crafted jewellery by Oneiro and some wicked fedora hats. It was the perfect mix of a punk-yet-glam look on the runway. Overall, this year’s Saskatchewan Fashion Week was one for the books.